Slightly more stylish than your average skinnies, these dynamic pants will soon become a fall staple. I’ll admit, I’m a little partial to hunter green (it’s one of my school colors), but I swear: If there’s one way to get your wardrobe ready for fall, it’s with this gorgeous color. 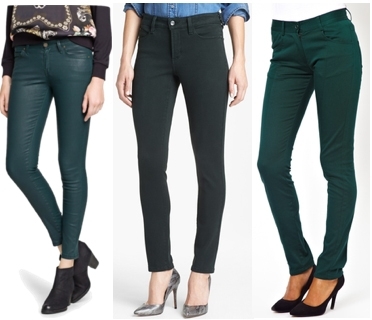 And what better way to try out the trend than with an awesome pair of hunter green jeans? Slightly more stylish than your average skinnies, these dynamic pants will soon become a fall staple. Below, check out two outfits I’ve created for a pair of deep green jeans, and get ready to be inspired! Get a little retro flair by pairing your jeans with a nautical-inspired collared blouse that incorporates lots of fall colors. I especially love the key print on this ModCloth top! Add a feminine, structured satchel and deep chocolate Chelsea boots for a more collegiate-chic look. 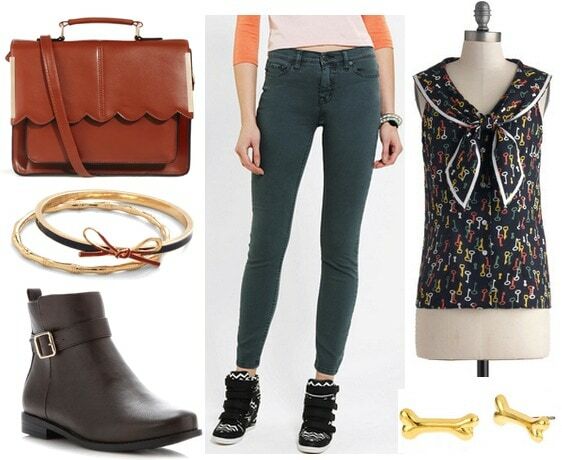 Accessorize with girly pops of gold — try a couple of bow-topped bracelets and some cool bone-shaped studs. Say goodbye to summer by rocking an edgy printed bralet with plenty of fringe. (After all, these jeans are high-waisted, so you don’t have to worry about showing too much skin!) Add a bright cobalt cross-body bag and a pair of classic black pumps for instant elegance. Next, create a funky vibe with a pair of grey geometric drop-earrings, and complete the look with a dash of deep red lip gloss. So glamorous! Do you love the hunter green trend for fall? How would you style these jeans? Be sure to let me know what you think of the outfits in the comments, and what other pieces you’d like to see featured on Class to Night Out!